It’s cold right now, but soon the planting season will be upon us. Late January and early February are great times to start planning your spring garden, especially in Texas. Come harvest time, it’s extremely rewarding to reap the healthy, (hopefully) organic fruits and vegetables of your labor. Don’t know where to start? Don’t worry. We’ve compiled some helpful tips on planning your garden this spring. 1. Select the best site for your garden. Vegetables need lots of sun to grow successfully. As long as it’s not the middle of summer, direct sunlight for most of the day is best. Many vegetables like tomatoes, peppers, melons, cucumbers, and squash need 8 to 10 hours of direct sun for maximum yield. Leafy vegetables like lettuce and cabbage and root crops will need some shade so that they don’t dry out. 2. Prepare the soil. Garden plans need nutrient rich soil to flourish. More than likely, you will need to amend your soil before planting. You can till the soil to loosen it, and then add rotted barnyard manure and finished compost. While this may sound a little unsettling, these are the kind of nutrients that plants crave. 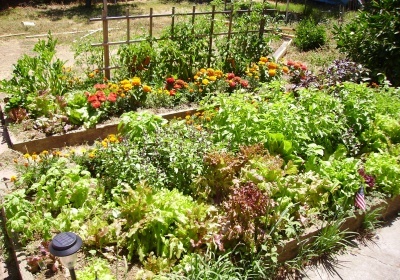 You can also make a raised garden bed, and buy nutrient rich soil from your local gardening store. Just make sure you prepare the soil before you plant. 3. Determine what vegetables you really love, and will eat often. You want to enjoy the spoils of your harvest, right? So plant things that you won’t get tired of easily. Many plants (such as broccoli) need to be harvested every 2-3 days. This means lots of broccoli once harvest comes around. 4. Determine how much space you’ll need for your garden. Different plants need different amounts of space to grow. You’ll need to plan out exactly which vegetables are going to be planted in which space. For example: broccoli, beans (lima), cauliflower, and peppers need between 12 and 20 inches space between them. Plants like beans (green), beets, carrots, garlic, lettuce, onions, and spinach need less room, between 2 - 6 inches. A 4’ x 8’ space may seem small, but you can actually grow a nice amount of vegetables there. Just make sure you group the like veggies together, and give them their space. 5. Make sure you’ll be able to reach every plant. Each plant in your new garden will need to be inspected, trimmed, and harvested. So make sure that you can easily reach each plant without crushing the others. While this may seem like common sense, you’d be surprised how many people plant their peppers in a corner behind feet of spinach and tomatoes, and have to step on some to care for others. It’s helpful to draw out a layout for your garden, and keep this in mind while planting. 6. Plan out your planting dates. This is the most important decision regarding your garden. You’ll want most of your crops to mature before the weather gets too warm, so planting your plants early is key. Mid-March is the average time to begin planting, but some cold season vegetables like broccoli, cabbage, and cauliflower should be planted in early February. Some other crops to begin seeding in January and into February include beets, carrots, radish, turnips, lettuce and chard. For more information on the Best Planting Dates for Seeds in DFW CLICK HERE.